A trust at times may be the only way to ensure your wishes are carried out beyond the grave. It remains one of the simplest and best ways to help protect you while living and protect your heirs after you pass. It is also a great idea to review your trust ever-so-often as I have seen many trusts unnecessarily create complex estates when there are ways to simplify the process. The reasons for using trusts can be extensive but below are some of the most common reasons you should still consider using one. This means a million-dollar estate (easy to reach in CA if you are a homeowner) will have to pay fees of at least $23,000! Probate is something that can be avoided with some simple planning and a trust can be the simplest way to avoid it. By the way, probate results are public record, but a trust will avoid this and help keep your information private. The reality is that most estates run out of money by the time the money reaches the heirs. 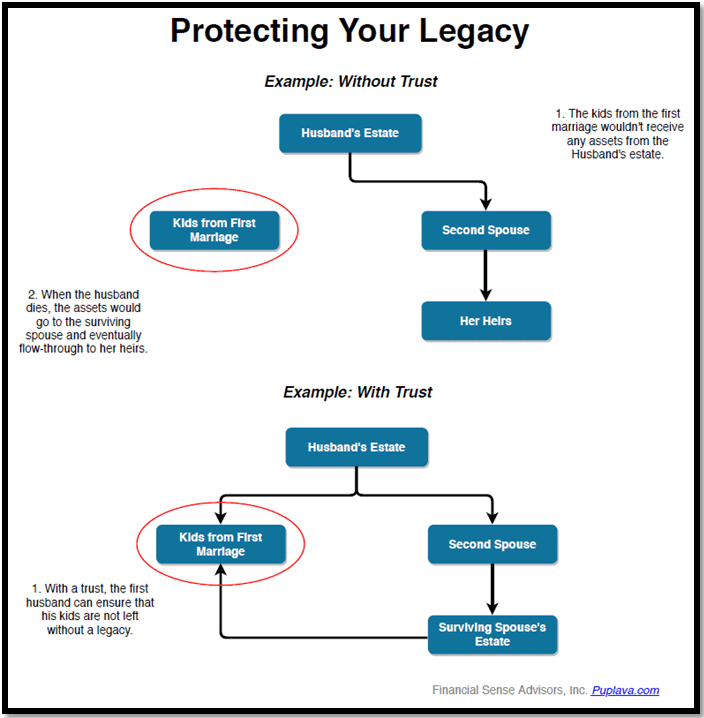 Proper estate planning using trusts can ensure the money is used how you wish and provides double protection for your heirs. There are times you may not want your heirs to receive all the money at your death, or you may have special wishes and a trust can be a good way to execute those objectives at the right time. Having a trust will help protect your wishes and make sure your kids are properly cared for. It is a way to make sure the money is used for the kids’ benefit and can allow for you to set parameters around how the money is spent. Some practical examples are trusts that prevent the heirs from touching the money until a certain age. Other provisions can be made in a trust that allows heirs to take out money before a certain, pre-determined age but only for things like education or a new home purchase. In my experience, it can be potentially dangerous naming a child’s guardian as a beneficiary because they are not legally obligated to use the money for the benefit of the child. For example, take an aunt who is made the beneficiary of an insurance policy instead of the legal minors of the policy owner. In the event that the policy owner dies, and the death benefit is paid out, the aunt would have no legal obligation to give anything to the policy owner’s young children. Instead, the proceeds from the life insurance would eventually go primarily to the aunt’s heirs. There are many different ways to avoid these types of issues but a trust is one of the most common tools used when minor children are involved. There are several states that have an estate tax. 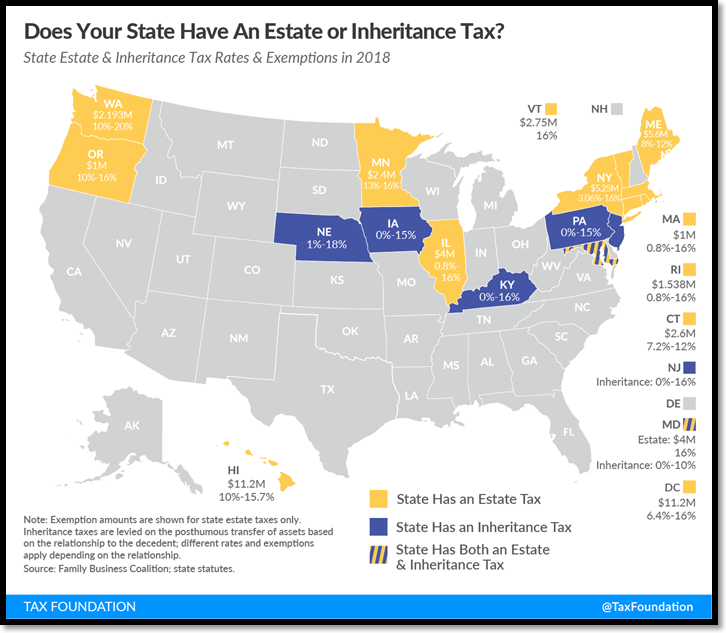 If you live in one of these states (or relocate) and have an estate that’s subject to an estate tax, this may warrant planning with an Estate Planner. Given the recent changes to the estate tax laws raising the exclusion amount per person from $5.49 million in 2017 to $11.18 million, even fewer people will be impacted by estate taxes. The reality is that before the recent tax law changes, less than 1% of the population had estates even large enough to pay the estate tax. I love what I do and that is primarily to help people achieve their goals. Unfortunately, life is full of all sorts of unexpected twists and turns but having a trust in place can be a valuable tool. Too many times I have helped grieving heirs and spouses as they lose loved ones due to unexpected tragedies like terminal cancer they found out about too late or losing a spouse to a drunk driver. We all know someone we have had to watch this happen to. With a trust, an attorney can also draft up very necessary documents that appoint Power of Attorneys or Medical Directives for a client who becomes incapacitated or whose health is diminishing. I often see clients having trusts with these accompanying documents, however, seldom do I see these documents without a trust. Meeting with an estate planner can help you plan for the unknowns in life and having an estate plan (and a trust) is so important for when life happens. As stated at the beginning, a trust may at times be the only way to ensure your wishes are carried out beyond the grave. It remains one of the simplest and best ways to help protect you while living and protect your heirs after you pass. It is also a great idea to review your trust ever-so-often as I have seen many trusts unnecessarily create complex estates when there are ways to simplify the process. As always, please speak to a licensed professional about your circumstances and individual estate planning needs. To contact Paul Horn, Certified Financial Planner™, email him at paul[dot]horn[at]financialsense[dot]com or by phone at (858) 487-3939.